"...engaged in the development and commercialization of technology for marine transportation of compressed natural gas (CNG) [They do this through a] innovative marine CNG technology -- the Coselle. The Coselle is a large-volume, high-pressure gas storage module. Coselle is a contraction of the words “coiled pipe in a carousel”. 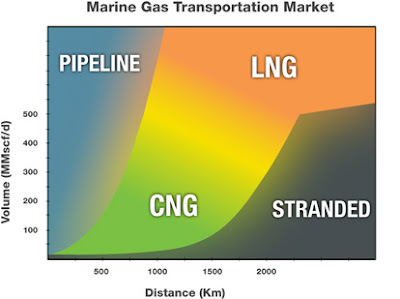 [The result is] efficient transportation of CNG by ship with a minimal onshore footprint [and] a highly economic solution for realizing the potential of many unexploited or underexploited natural gas reserves." "While the energy density of CNG is about half that of LNG and will therefore require more shipping capacity, CNG loading and discharge facilities are much simpler, much less expensive and have a significantly smaller footprint. 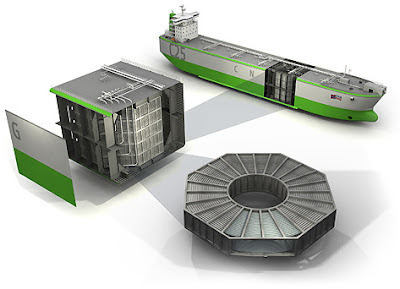 The result is that CNG provides a significantly more economic solution, which is easier and quicker to permit and implement, for the transportation of smaller volumes of gas over shorter distances." This is a brilliant scheme which will be tremendously valuable, especially in emerging markets with fast growing coastal activities and where economies of flexibility are key. This finale video summarizes the basic Sea NG shuttle transportation service for CNG... P.S. There are other approaches to shipping CNG.